February 10, 2017 by Ecommerce News. About Statistics with tags The United Kingdom. 52148 views. 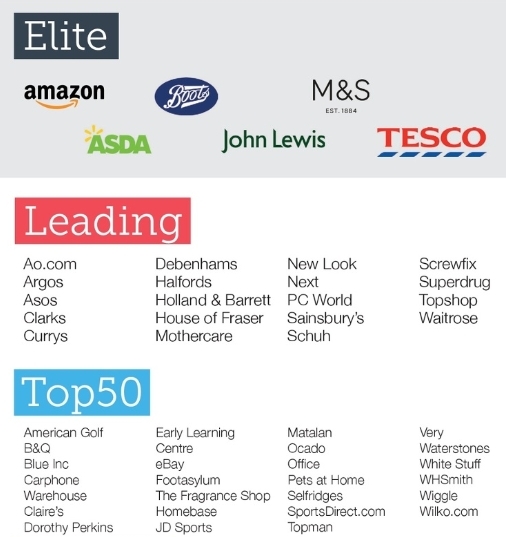 Internet Retailing published its latest UK Top500 list, which shows the top online retailers in the United Kingdom. Retailers such as AO, ARgos, Holland & Barrett, Topshop and Next are among the leading ecommerce players. It’s the third time Internet Retailing published a top 500 list of top retailers in the UK’s ecommerce and multichannel retail industry. Last year, Amazon, Argos, Boots, House of Fraser, John Lewis, Mothercare and Screwfix have been called the Elite retailers of 2016. In this year’s edition, that title goes to Amazon, Asda, Boots, John Lewis, M&S and Tesco. Internet Retailing analyzed the performance of the top online retailers based on different criteria. It found out that the Top500 retailers offered an average of five communication channels to their customers and between two and three different delivery options. 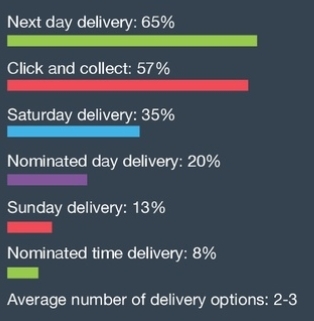 Next-day delivery was the most popular premium option, offered by 312 of the 500 retailers. Retailers were also more likely to deliver next day than to offer collection, which was offered by 266 ecommerce companies. Same-day delivery (29) and nominated time (40) were far less popular.